Hi, I am interested in your 2016 Dodge Challenger R/T (stock #136363) listed on Autotrader for $59,900. I'd like to get more information about this vehicle and confirm its availability. 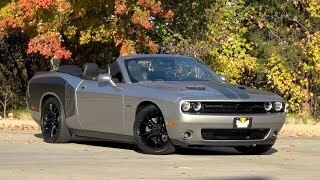 Shaqs Custom Challenger R/T Convertible 5.7L HEMI V8 Automatic 5,117 Miles /// Built for NBA super star Shaquille ONeal, this 1-owner Challenger convertible has roamed a mere 5,117 miles of clean blacktop. Pull the car under the lights and youll find crisp Billet Clear Coat thats been dressed in sinister Hemi banners. Below that lust worthy canvas, original sheetmetal fits precisely, displaying excellent build quality. A close look down that slab-sided fuselage reveals not so much as a dent or ding anywhere. And it all adds up to one slick modern MoPar that wraps world-beating performance in a substantial sense of style! At the heart of this Challenger, a stout, 5.7 liter Hemi V8 utilizes 375 horsepower to transform whats essentially a comfortable touring coupe into a heavyweight stoplight slayer. The powerful mill commands eight forward gears through a tough ZF automatic, which twists a trusty anti-spin differential around friendly 3.08 gears. Power-assisted steering ensures youll want to do more than make traditional NASCAR lefts. Braking comes courtesy of power-assisted calipers. And at the corners, upsized blades spin 245/45ZR20 Goodyear Eagle RS-As. Look inside this Dodge and youll find a comfortable and stylish cockpit thats ready for long road trips and plenty of summertime fun. Supple Katzkin seats feature 18 inches of adjustment for the cars driver. A driver-oriented dash features highly detailed telemetry, dual-zone climate control and Chryslers lauded Performance Pages technology. Uconnect infotainment mixes convenient Bluetooth connectivity and reliable satellite radio with crisp Alpine audio. And in front of the driver, a leather-wrapped steering wheel spins factory cruise control and small shift paddles around a tilting column. Sporting only 5,117 miles, this showroom-fresh MoPar is the perfect car for any enthusiast who wants to hit the hobby rolling. Call, click or visit www.RKMotors.com for more information.